Announcement The Cherry Chick designs little pieces of art in the form of beaded jewelry to include beaded earrings, beaded bracelets, hand beaded necklaces, and lampwork glass rings most of which are one of a kind pieces. I like to work with lampwork glass beads that are for the most part created by self represented artisans based here in the USA. I love cherries and checkerboards so you will see that represented in my jewelry designs. It might remind you of the artwork of Mary Engelbreit who I had the opportunity to create a Limited Addition Collection of Cherry Chick Jewelry that was sold on her website. If you are a quilter or enjoying sewing please check out my other Etsy shop www.esty.com/shop/DecorativeSewingPins here on Etsy. In that shop I sell Decorative Sewing Pins, pincushions, Scissor fobs, Sewing tins, Needle minders, and more cute stuff. Please see my About page to find out more about my business. 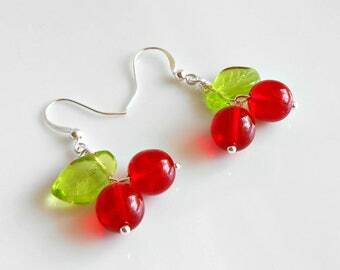 The Cherry Chick designs little pieces of art in the form of beaded jewelry to include beaded earrings, beaded bracelets, hand beaded necklaces, and lampwork glass rings most of which are one of a kind pieces. I like to work with lampwork glass beads that are for the most part created by self represented artisans based here in the USA. Vicki has fresh ideas and I really like the colors she uses. I will check out her site when I'm on Etsy shopping for something else and I find there is always something new on her site that catches my eye. She is wonderful to work with. Share your Heart this Valentine's Day! One of A Kind lampwork glass heart necklace for your Love. Too early to think about Fall??? 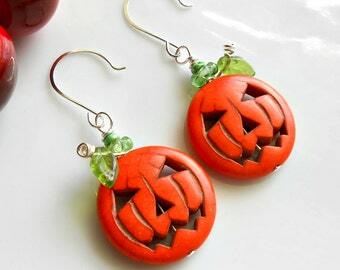 Four new Jack O' Lantern earrings designs have been added to my shop today. All one of a kind designs. Get your Spooky on. It's a Garden of Decorative Pins for that sewer and quilter on your Christmas gift list. Add some pizzazz to your bulletin board when you use these fancy pins to tack up your note. Use them on a scrapbook page or pin one in your hat...tons of ideas! Cherry Chick Studio production of the necklaces for Mary Engelbreit Studios. I've been somewhat "artsy" for as long as I can remember. Pair that up with my experience in retail and wholesale, finding myself unemployed due to a lay off, a love for technology and Cherry Chick Jewelry was born in 2003. I created my first website back then where I sold various styles of Artisan crafted jewelry. A few years later I created another website, www.CherryChickJewelry.com, where I focus mostly on whimsical designs. In 2012 after yet another lay off, I had the good fortune to create a Limited Edition Collection of Cherry Chick Jewelry that was sold exclusively on the illustrator Mary Engelbreit's website. My dream is to make designing jewelry my full time career. I have some wonderful customers who I truly appreciate and tell me that they "Love" my jewelry. The trick is to just find more of those wonderful customers. So if you like my designs please tell your friends who will then hopefully tell their friends. You'll find me on Pinterest or on my blog CherryChickJewelry.blogpsot.com where I share more about what's happening in my life. Thanks so much for your interest. Hi...I'm the Cherry Chick behind Cherry Chick Jewelry. It's just me and my cat Missy who sometimes tries to help me with shipping. She is my creative muse for sure. Thanks for stopping by and taking a look at our wares. We truly appreciate you. Thank you so much for stopping by to check out what I have to offer. I truly appreciate your business and will do everything within my powers to make it a pleasant experience.